One of my favorite new additions to our holiday season this year is the Scentsicle ornaments that I was sent a few weeks ago. Since we have a fake tree, we don’t get that cozy Christmas tree scent, unless we burn a candle. These ornaments hide in our tree and make it come alive with the scent of real Christmas tree! Now for the winner of the O’ Christmas Tree Giveaway…. 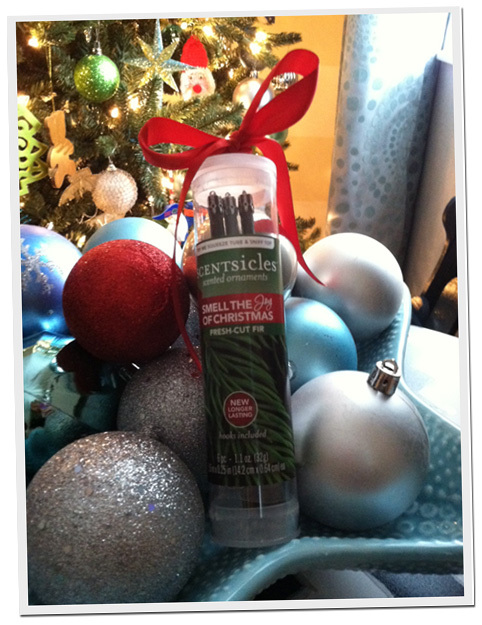 the lucky winner who get’s to try out a package of Scentsicle ornaments is… Melissa! Congrats & Enjoy!!! Didn’t win this giveaway? No worries… we have got anther Gracious Giveaway coming at you later today! Enjoy today!